Lateral sinus thrombosis is a potentially life-threatening complication, if any delay in its diagnosis and management. The altered clinical picture in the era of antibiotics may be misleading. Therefore, early diagnosis, aggressive medical and surgical management are required for successful outcome. Here, we present a pediatric case which was presented with lateral sinus thrombosis secondary to chronic otomastoiditis with successful outcome. A brief review of literature regarding clinical signs, symptoms, and treatment option are discussed. 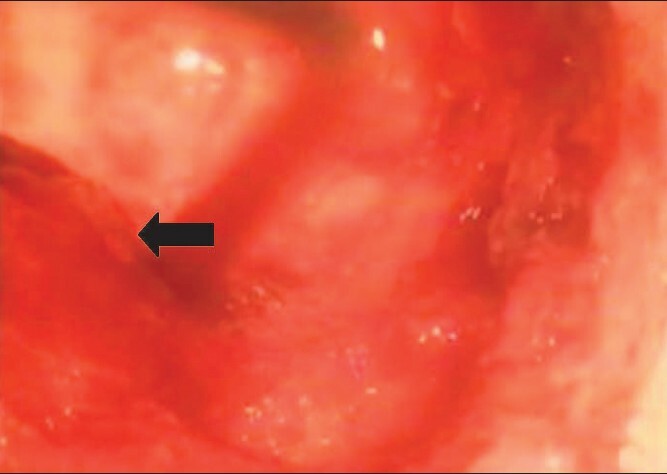 Lateral sinus thrombosis is now a rare but serious complication of otitis media. It requires early diagnosis and treatment. Classical picture is often modified because of antibiotic therapy, making the diagnosis of the occasional case of the lateral sinus thrombosis more difficult. This change in clinical course and decrease in incidence requires high degree of suspicion to make the diagnosis. A 12-year-old boy presented with fever, chills, and vomiting for the last five days. There was a history of intermittent left ear discharge for the past four years. Patient was admitted and given intravenous broad spectrum antibiotics. However, after two days, he developed pain in the left side of the neck with painful neck movements. Patient was often treated for similar complaints in the past four years with temporary relief of the symptoms. On examination, patient was febrile. Tenderness was present along the internal jugular vein and sternocleidomastoid muscle. Mastoid tenderness was absent. Otoscopic examination showed posterosuperior granulations. The pars tensa was retracted and lusterless. Pars flaccida was normal. Tuning fork test revealed a mixed hearing loss in the left ear and right ear was normal. Pure tone audiometry showed moderate mixed hearing loss on left side. Cranial nerve examination was normal and signs of meningeal irritation were absent. Routine blood and urine examination was normal. Cerebrospinal fluid (CSF) analysis was within normal limits. High-resolution computed tomography (CT) temporal bone showed soft tissue density in the middle ear and mastoid air cells with erosion of sinus plate and ossicular chain [Figure 1]. Under general anesthesia, Canal wall down mastoidectomy was performed. 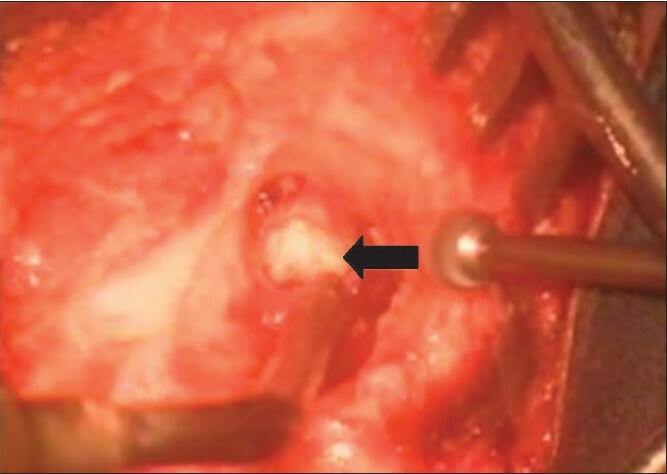 On opening mastoid, pus gushed out from the antrum which was sent for culture and sensitivity. 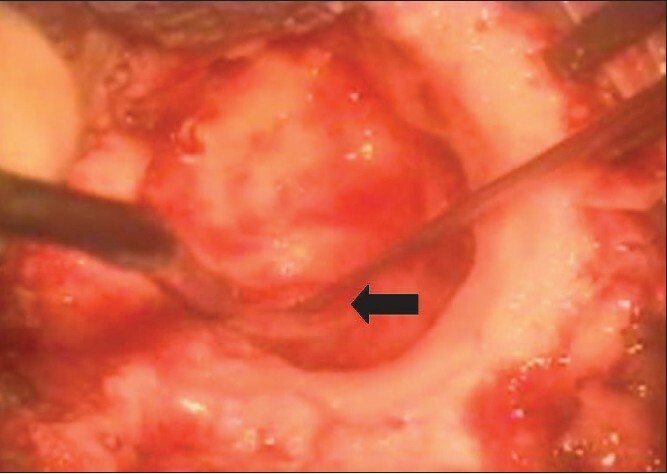 Cholesteatoma sac was seen occupying the antrum and eroding the sigmoid plate [Figure 2]. Lateral sinus was exposed and covered with granulations. Malleus, stapes were intact, long process of the incus was eroded, and horizontal part of the facial canal was dehiscent. On clearing granulation tissue and widely exposing the Lateral sinus [Figure 3], we noticed that lateral sinus wall was thickened. On opening the sinus, there was no free flow of blood and the sinus lumen (1-1.5 cm) was completely obliterated by fibrosis [Figure 4]. Exploration of the lateral sinus beyond the fibrosed segment revealed no thrombosis. Reconstruction for hearing was differed. Antibiotics were given for two weeks. Anticoagulants were not considered. Postoperatively, mild facial nerve paresis was present which recovered spontaneously after three days. Postoperative period was uneventful and patient was discharged on tenth postoperative day. When the diagnosis is delayed, thrombus will get organized. 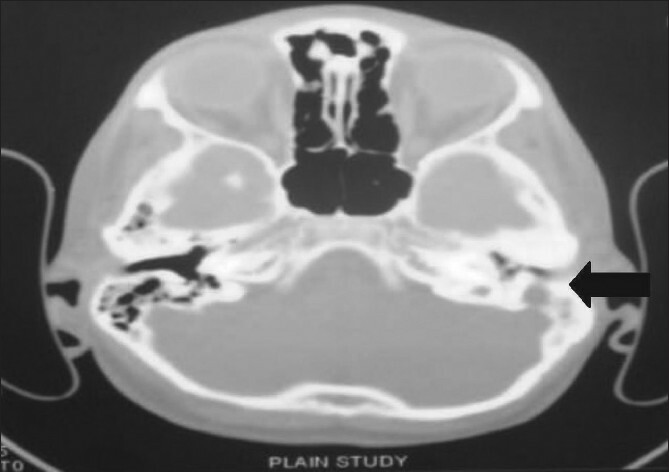 CT scan is often regarded as radiological investigation of choice for diagnostic purpose which shows delta sign (an empty triangle at level of sigmoid sinus). CT, Magnetic resonance (MR) imaging, and MR angiography are more accurate in the diagnosis of lateral sinus thrombosis. Lateral sinus thrombosis is now a rare intracranial complication of otitis media. Therefore, clinician should have a high degree of suspicion in the modern day of antibiotic era in any patient with ear infection that fails to resolve. Consider imaging to make early diagnosis and timely medical and surgical intervention to minimize morbidity and mortality. 1. Levin SC, DeSouza SC. Intracranial complications of otitis media. In: Glasscock III ME, Gulya CJ, editors. Shambaugh's Surgery of the Ear. 5 th ed. Ontorio: BC deckers Inc; 2003. p. 443-61. 2. Smith JA, Danner CJ. Complications of chronic otitis media and cholesteatoma. Otolaryngol Clin North Am 2006;39:1237-55. 3. O,Connel JE. Lateral sinus thrombosis: A problem still with us. J Laryngol Otol 1990;104:949-51. 4. Syms MJ, Tsai PD, Holtel MR. Management of lateral sinus thrombosis. Laryngoscope 1999;109:1616-20. 5. Dubey SP, Larawin V. Complications of chronic suppurative otitis media and their management. Laryngoscope 2007;117:264-7. 6. Ooi EH, Hilton M, Hunter G. Management of lateral sinus thrombosis: Update and literature review. J Laryngol Otol 2003;117:932-9.